To many, Gordie Howe is known simply as Mr. Hockey. Both Bobby Orr and Wayne Gretzky called Howe, who was born in Floral, Sask. and raised in Saskatoon, the greatest to ever play the game. He’s known for his toughness and his elbows, for playing until age 54 and suiting up with two of his sons. He’s known for wearing number 9 for the Detroit Red Wings. He’s known for lighting the lamp, winning the scoring title six times, and winning MVP another six times. He holds records for all-star game appearances, games played, and points in Red Wings History. To many, he’s an icon, a hockey hero. But to Murray Howe, he’s just known as dad. Murray is Gordie’s youngest son; one who never took to the ice at the NHL level. 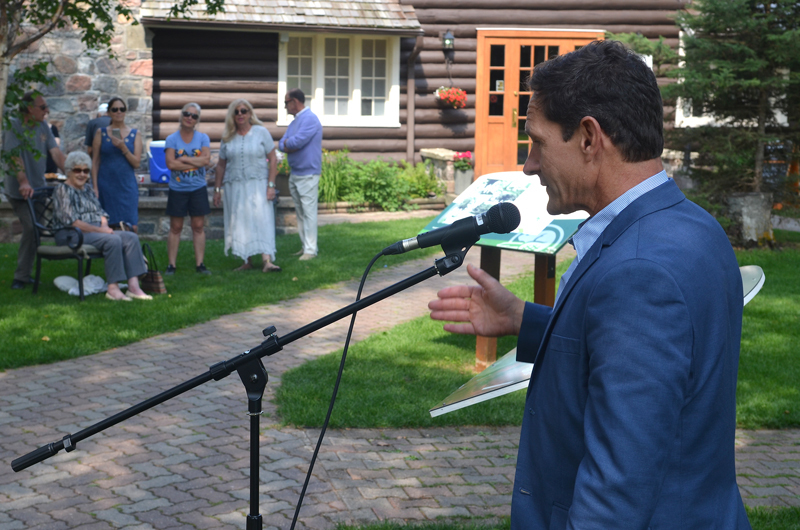 “I was really fortunate that both of my parents made sure that we knew it wasn’t important to them that I make the NHL, it was only important to them that I do what I love,” Murray said after a book signing at Waskesiu’s Hawood inn Saturday. This was the Gordie Howe Murray knew — a humble father with a loving heart who happened to be a world-class hockey player. Murray learned a lot from his father and recounted it in a book he read from and signed at Saturday’s event, called Nine Things I Learned from my Father. Murray also delivered the eulogy at his father’s public funeral on June 15, 2016. Jim Kerby’s wife was watching on TV that day and gave him a call. 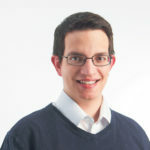 Kerby is the chair of the Waskesiu Community Council and a past chair of the Waskesiu Foundation. “Partway through the eulogy, (Murray Howe mentioned Waskesiu was his dad’s favourite place on earth,” Kerby said. That inspiration grew Sunday, August 5, 2018. 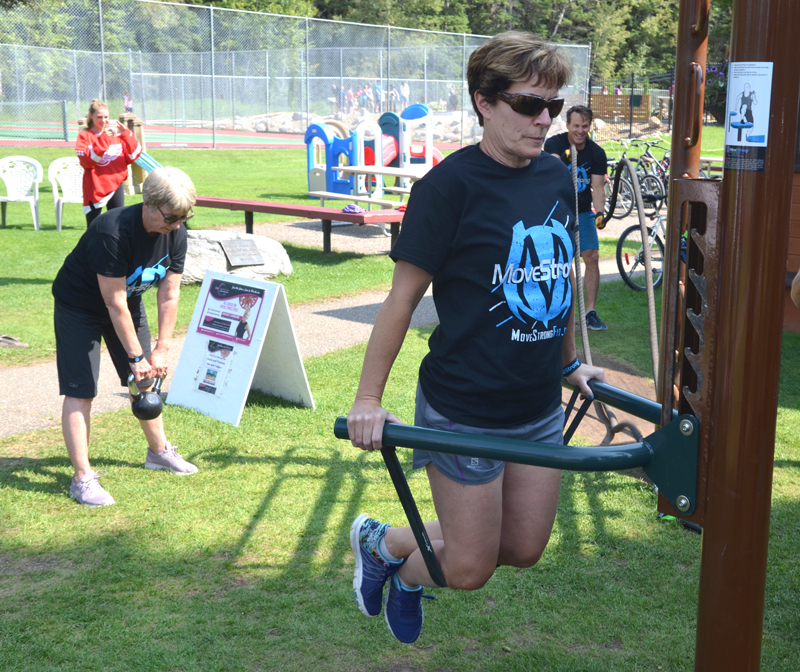 Howe’s love for Waskesiu and his legacy as a hockey player and as a person was immortalized in history, as the Waskesiu Foundation dedicated its new outdoor fitness park as Gordie Howe Fitness Park. Two signs, one in French, one in English describe, a bit about Mr. Hockey. Murray was on hand for the celebrations. So was Howe’s older sister, Vi. 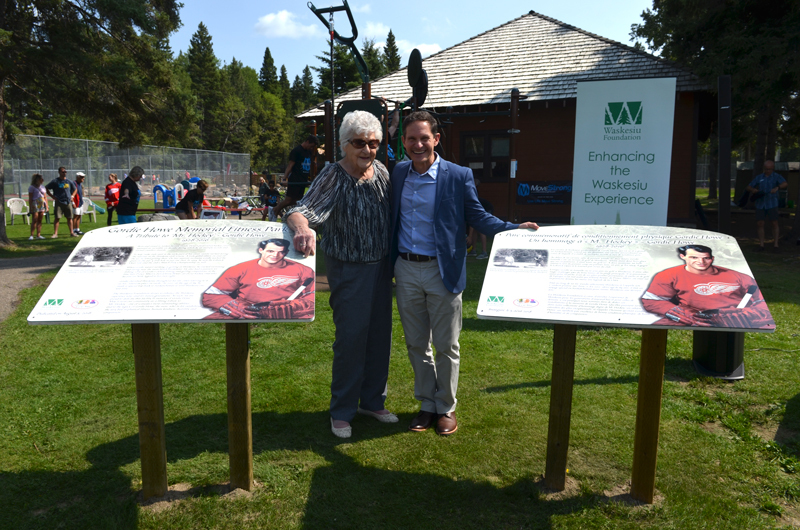 Murray’s book signing Saturday night, a second signing Sunday morning and a pair of unveilings, one at the fitness park and one at the Lobstick Golf Course were all a part of the Gordie Howe Day celebrations. While Howe loved the park, there’s also another connection. He would have been 90 this year, the same year the National Park itself is celebrating its 90th birthday. A room in the Lobstick Golf Course in Waskesiu has a shelf of trophies. 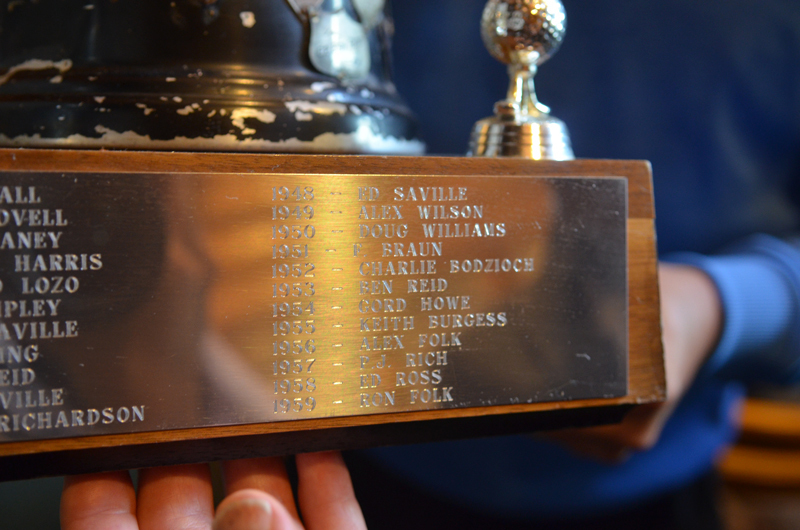 Like many trophy rooms in many golf courses, it lists the winners by year of major awards, such as the club championship. 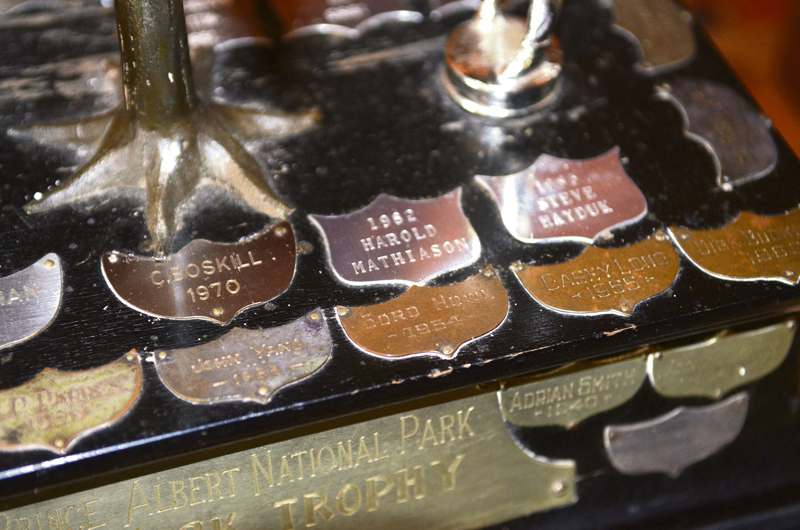 On the front of that trophy, in plain view, is a name and a year: Gord Howe, 1954. In 1954 Gordie Howe was playing for the Detroit Red Wings. He finished the regular season with 33 goals and 81 points in 70 games, along with 109 penalty minutes. He won the scoring title that year and went on to score nine more points and take 31 minutes of penalties in the playoffs. The Detroit Red Wings would go on to win the Stanley Cup. Howe has a few course records too. He’s likely the only one of only a few to drive the green on hole one, a par-4, 300 yards to the hole, with a club that amounted to little more than a putter-shaped three wood. “If you look at that club and where the dents are in it, he hit that ball square every time,” Murray Howe said. But Gordie Howe wasn’t just a good golfer. In summers in Waskesiu, he worked at the golf course as a greenskeeper. He would work hard until 11 a.m. on the greens making sure they passed his boss’s inspection. Then, Howe would pack up and head down to the shop to help Prince Albert’s Johnny Bower, a hockey legend in his own right, finish up. The two would spend the afternoon fishing or golf together at Lake Waskesiu. 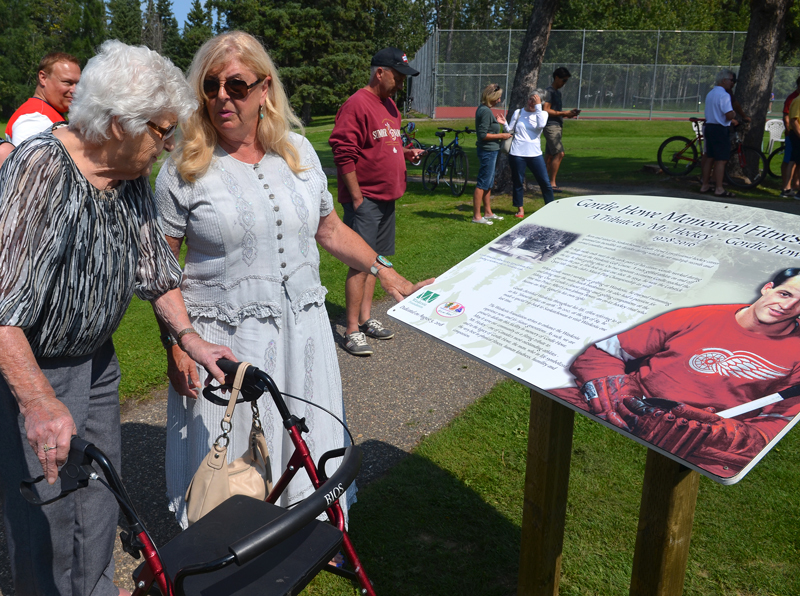 That love for golf and time spent on the course, both driving the ball long and true, and working to keep the greens in pristine condition, inspired the second dedication of Sunday, a sign at the golf course detailing Howe’s connection with the place. 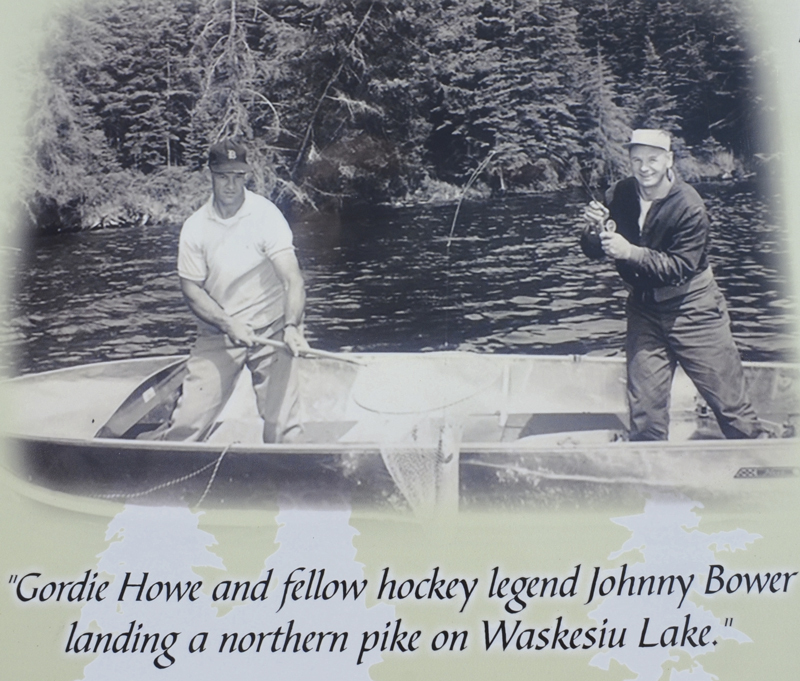 This image on one of the new Gordie Howe signs shows Howe, left and Leafs great Johnny Bower landing a pike. 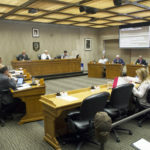 “We knew this was something we needed to do,” said Mike Ryan, the chair of the golf club board. Growing up, to Murray, “Waskesiu” was just a word, a place his dad told stories about sometimes. He didn’t know about the golf trophies, or the fishing with Johnny Bower, or the ice cream on the corner. Murray said his dad talked about Waskesiu all his life. In 2012, Gordie, Murray and Murray’s son, also named Gordie, made the trip to Waskesiu. It would end up being Gordie Sr.’s last trip before his death in 2016. The trio stopped everywhere, including in some of Gordie Howe’s childhood homes, where he would ask surprised homeowners to come in, and ended up signing his name, at the homeowners’ requests, on some of the walls. He returned to the beach and gave pointers to a few kids trying to fish. He signed dozens of autographs, and then he went to the golf course, where he first met Jim Kerby. Kerby was putting his clubs into the back of his car when Howe walked by and said hello. “He was wonderful. There was no rush. 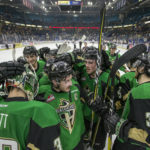 He took his time to talk to us and he had a great sense of humour,” Kerby recalled. Murray said it took the group of them over 20 minutes just to walk from the parking lot to the club, a distance of no more than 100 metres, because of all the people who wanted to talk to the hockey great. “It didn’t matter what you were doing, he would stop and try to see if he could help in some way,” Murray said. The Howes went around the course, and Gordie showed his son and grandson every spot and every stroke he would take on every hole. “He memorized every hole on this course,” Muray said. Saturday, Murray Howe was recounting those stories, and the lessons he learned from them, in front of a packed house. Close to 100 people came out to hear about what Gordie Howe was like off the ice, in the place Gordie Howe most liked off the ice. Murray hopes that people who attended his book reading and who get to learn more about his dad realize that it’s not what you do that’s important, but what you do for other people. “The biggest thing is … to realize the impact they can have on others just by being the best version of themselves,” Murray said after his book signing. That was the main lesson Gordie Howe the dad taught his sons, to serve others and use every moment to try to improve others’ lives and to never waste a second to make a memory. 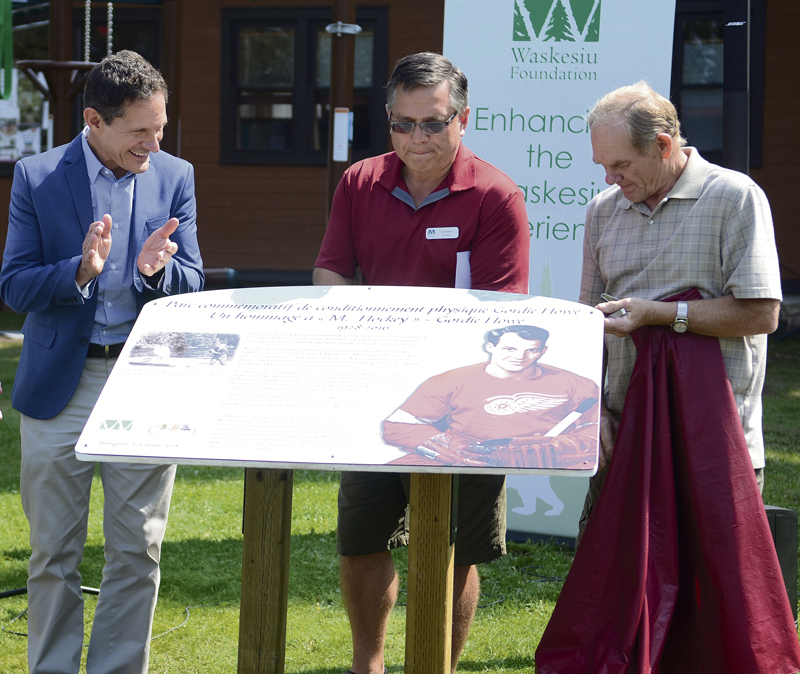 It’s that Gordie Howe, the father and the man, his sister and son were hoping would live on at Prince Albert National Park. 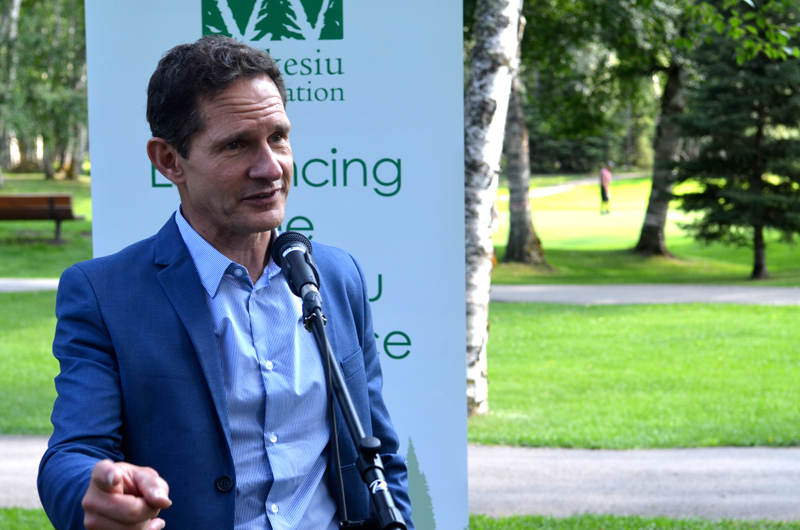 The Waskesiu Foundation, which put on the recognition ceremonies, is happy to do its part. Howe’s sister, Vi, also felt the tribute was appropriate. She remembered all the times her brother would come home to Saskatoon, only to leave a few days later. That’s why, Murray said, it’s so fitting for his father to have these memorials in his honour in his favourite place on earth. “He was Mr. many different things. Hockey for sure was one of them, but he was really Mr. humanitarian as well. 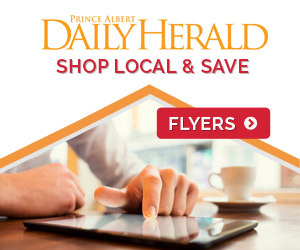 He was so good at serving others, being kind to others, and I think you could argue that he did that even better than he was at being a hockey player,” he said. Sunday’s ceremony, Murray said, would have been the type of thing his dad wanted, not because of what was done for him, but because of how it made people feel.